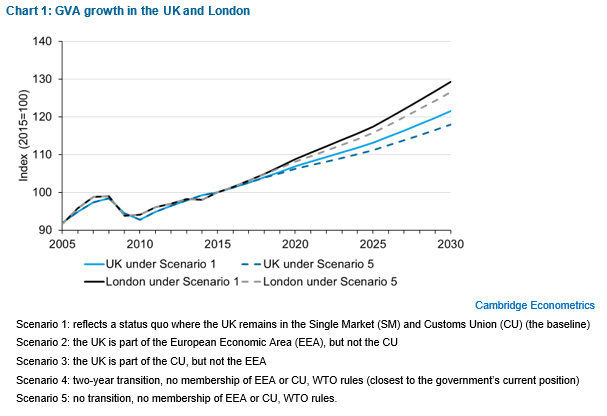 Cambridge Econometrics’ study ‘Preparing for Brexit’ published today by London Mayor Sadiq Khan represents a new insight into the local economic impacts of the UK’s exit from the European Union. This independent analysis of Brexit reveals the potential economic risks – and human costs – at stake in the negotiations …. I’ve released these impact assessments because the British people and our businesses have a right to know the likely impact on their lives and personal finances. This new analysis shows why the Government should now change its approach and negotiate a deal that enables us to remain in both the single market and the customs union. It is thought that London will emerge relatively better than the rest of the UK because it has a higher concentration of high-value sectors, which are more resilient and able to recover from economic shocks more quickly. This is the first time that the impact of Brexit has been comprehensively assessed across a number of key indicators and sectors at sub-national level, in this case clusters of London boroughs in both inner and outer London. The study adds a new dimension to existing studies and offers a valuable insight into the potential impact of Brexit on employment and output under a range of scenarios. We think that this approach could be applied to other parts of the UK to help political and business leaders plan for the future. 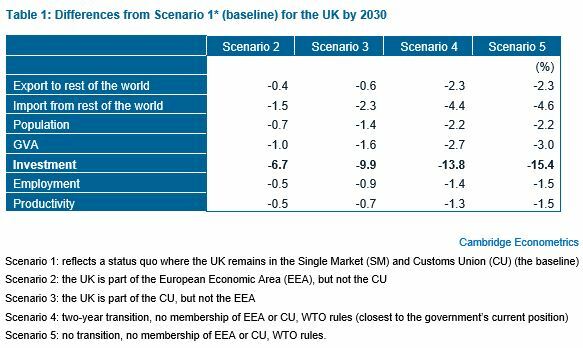 The modelling results show that Brexit will have a negative impact on the UK economy across all key indicators, in particular on investment where £20.2bn would be lost by 2030 under the ‘softest’ scenario and £46.7bn under the most severe Brexit scenario. London is expected to experience a loss of 30,500 people in employment under the ‘softest’ scenario, rising to 87,000 under the ‘hardest’ scenario, by 2030. However, it is not expected to be as negatively affected as the rest of the UK, in terms of GVA and productivity. The financial and professional services could experience up to 119,000 fewer jobs nationally in 2030 than would otherwise be the case. However, the science and technology, creative and construction sectors, which make up a high proportion of economic activity in the UK, particularly in London, are also sectors which will be hit hard by Brexit. To read the Greater London Authority’s full press release, please see here. To discuss our methodology or how our approach could be applied outside London please contact Ben Gardiner.